Once you've inserted your video URL into the popup and customized your Triggers, Conditions, and Cookies, you can then configure the settings for your Video Popup in the Video Settings Pane. Enabling this feature will force the video to go full screen once the popup is triggered. Important Note: This feature only works if you're using a Click Trigger. 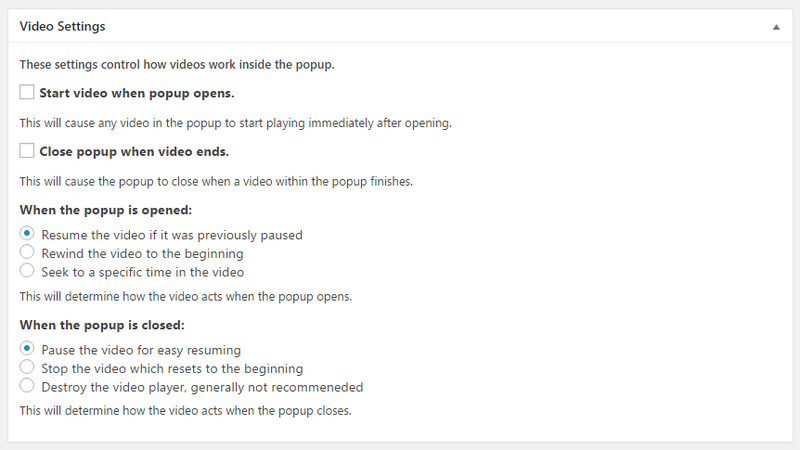 Enabling this feature will automatically close the popup when the video ends. Resume the video if it was previously paused - If a user starts the video, then closes the popup, when they open it again, the video will resume where it left off. Rewind the video to the beginning - When the popup is opened or reopened, this feature will force the video to start from the beginning. Seek to a specific time in the video (measured in seconds) - You can force the video to go to a specific time within the video by enabling this feature. Clicking this radio button will enable the Time to Skip to Feature Field. Insert the time to skip the video to, measured in seconds. Pause the video for easy resuming - If the user closes the popup, the video will pause in place, so that when/if they reopen it, the video will be in the same place when the popup was closed. Stop the video which resets to the beginning - You can choose to completely stop the video when the popup is closed, but this will reset the video back to the beginning. Destroy the video player, generally not recommended - Destroys the video player after the popup is closed. Typically only used in special cases where extra setup may be required. This only destroys the player, so the popup and video will still be there.